Kitchenaid 6 Qt. Mixer $193.99 (Regularly $499.99)! 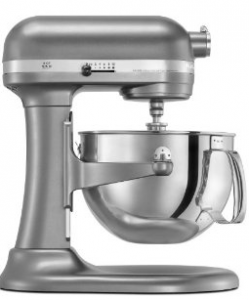 If you’ve been looking for a Kitchenaid mixer deal, this is for you! Right now the KitchenAid KP26M1PSL Professional 600 Series 6-Quart Stand Mixer, Silver (this is the BIG one) is $257.99. Plus, it qualifies for two rebates bringing the price down to $193.99! If you do not wish to receive the magazine and would like to request a refund of the subscription ($24 introductory value), please mail a copy of this rebate submission by 4/24/12 with your name and address to: Time Customer Service, Inc., P.O. Box 62160, Tampa, FL 33662-2160. I’m not sure how long this deal will last so grab it while you can.